I took a picture of her parts exactly where I found them so as not to disturb the crime scene. I'm thinkin' that the perpetrator has a penchant for blueberries. I'm wondering if there is some kind of message. A clue to be had... Barbie, blueberries... hmmmm. I think she looks fab. Add another career to her already busting at the seams resume: crime victim. I would say murder, but she is still smiling. Maybe she wanted blueberries, but didnt need to bring her whole body. I love a good sick sense of humour! Still trying to piece together the blueberry connection but decapitation? Yea, she had it coming! Barbie suffered a detached leg at our house this week. Luckily, the surgeon was able to reattach it. Polly Pocket on the other hand did not survive the trauma of losing her her entire lower body. She was found in no less than 5 pieces. What I want to know is, how did a Barbie doll get mixed up in a house of three boyz!? Haha. My brothers actually used to torture my Barbie dolls all the time just to make me and my sister upset. I guess it's a boy thing! But where is the black tape body outline? Holy crap! Did Briar sneak out? Are our kids already messing around because my tender firstborn loves her some blueberries and Barbie beheadings! You're too much. LOVE this! Huh. 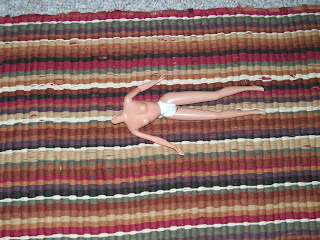 Barbie's murderer also lives at my house. But it looks as though mine wields an ax. And uses it to cut their hair before chopping them in two. It's a terrible sight, I tell you. Terrible. I think you have a future as a detective! Nice Job, Starsky. Hutch is probably still out chasing down the details of wtf her clothes are. Decapitating Barbie? Think I heart your kids. I have to agree with Wendy. 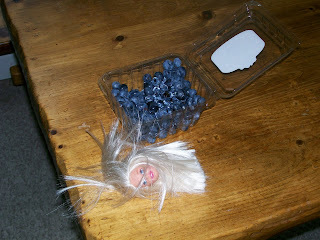 I think that Barbie is so emaciated, so desperate for nourishment, that she voluntarily popped her own head off, then, propelled herself along the floor toward the blueberries by alternatively flashing her megawatt smile and frowning. Just a theory though. I have no formal training in crime scene investigation, other than watching C.S.I. Too funny!! My guess - Middle did it in the library with a candlestick! Since my son is obsessed with with Toy Story, I am thinking it was Sid, Andy's nasty neighbor boy.